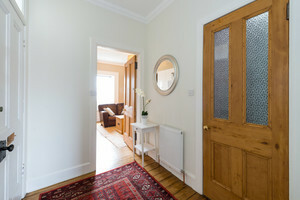 A bright and spacious holiday flat in Edinburgh's Southside, close to the city centre sights and attractions. 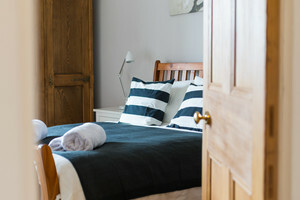 Stay in this 2 bedroom holiday rental property in Edinburgh that sleeps 4 with Wifi, Bath towels, Linen included. 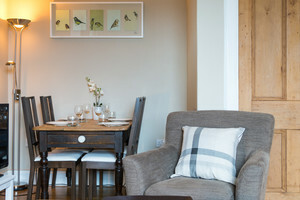 This stylish 2-bedroom holiday flat in Edinburgh is the perfect choice for groups and families of up to four people. An open plan design allows for lots of space and natural light. And the bright apartment is in beautiful condition. It makes a wonderful central base for a visit to Edinburgh. 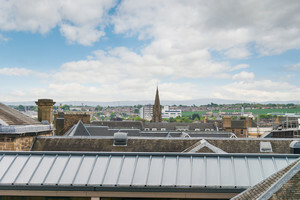 Located on the Southside of the city, close to the beautiful Holyrood Park. There are lots of bars and restaurants close by. 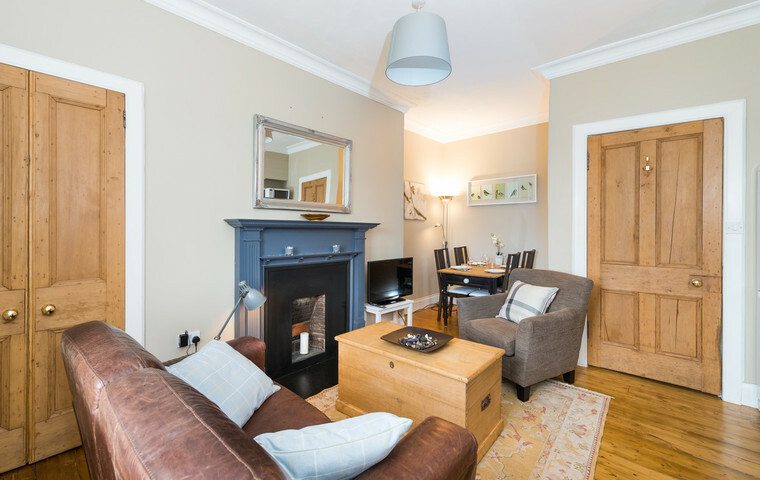 And it’s only a 10-minute walk to the Royal Mile and city centre shops and attractions. 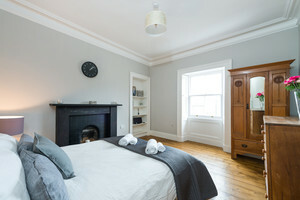 This holiday flat in Edinburgh has 1 king room and 1 double room. So, it would be perfect for families and groups of up to 4 people. 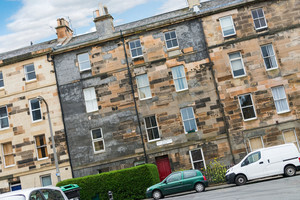 A lovely top floor apartment on West Newington Place in Edinburgh’s Southside. The entrance hall is open and spacious. You’ll need to climb several steep steps to to reach the top floor of this typical Edinburgh tenement building. But it's worth it to reach this bright and spacious apartment. You’ll find a wonderful open plan space, which provides the general living and dining area, with views across to the distant Pentland hills. 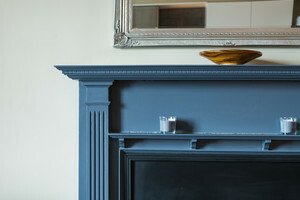 There’s a cosy corner for dining, and seating areas with a stylish fireplace and flat screen TV with Freeview. The kitchen area is very smart, with dark wood worktops, slate walls and is fully fitted for all your needs. 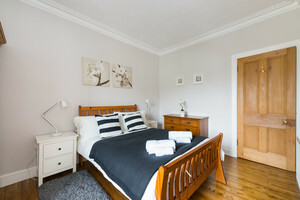 Both double bedrooms are large and decorated to the highest standard. 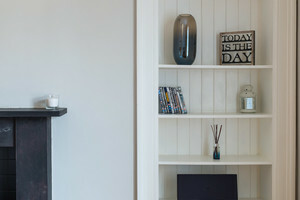 They come furnished with wardrobes, sets of drawers, bedside tables and lamps. The larger of the two also has a sound system and some DVDs to watch in the lounge. 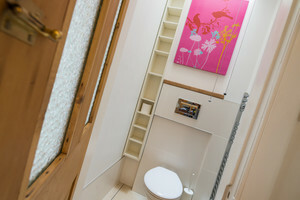 The luxurious shower room has a rainfall shower, and there is a separate WC for additional comfort. You can easily reach the Newington area by rail from other parts of the UK. Take a train to Edinburgh Waverley Station and it’s just a short taxi or bus ride from there. There is a very good local bus service in Edinburgh, with regular buses to the area. Parking notes As this is a city centre property, roadside car parking is restricted. There is meter parking available, for a maximum stay of 4 hours, between 8.30 am and 6.30 pm from Monday to Saturday. 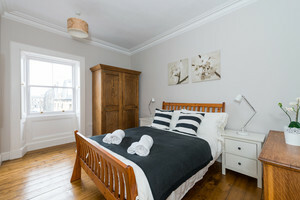 Local area This holiday flat in Edinburgh is situated in Newington on the Southside of the city. This is an incredibly popular and lively area, and it’s only a short walk into the centre of town. Close to Holyrood Park and Arthur’s Seat, the Meadows and the University of Edinburgh. This neighbourhood has a thriving community feel with plenty of independent shops, bars, restaurants and cafes. During the summer festivals, this area is the real hub of the action and a perfect place to soak in the atmosphere. A beautiful and stylish flat yet very comfortable and cosy. Well equipped and an excellent host who answered all my queries promptly. Very nice local area with bars and restaurants and the city centre easily accessible on foot. Would highly recommend it, we had a fabulous weekend staying here. 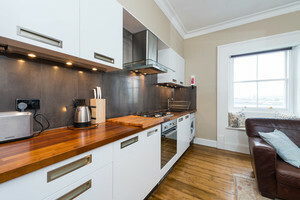 Awesome flat to stay in when visiting Edinburgh. It's far enough away from the hustle and bustle of the Royal Mile but close enough to walk to. Warm and cosy. Large rooms. Clean. Thanks for a nice stay! My sister and I stayed here for 4 nights in April. We loved it. It's clean and cozy and a great location, only a 15 min. walk through the Meadows to the university and sights of the Old Town. But just out the door there's everything you need - restaurants, stores, pubs, etc. We liked the neighbourhood (Newington). Bustling but not noisy. The stairs weren't a problem for us but yes it is the top floor. No complaints, I'd definitely stay here again! This place is super for both short and long trips. I was there for 10 days. The flat is/was very clean and comfortable. 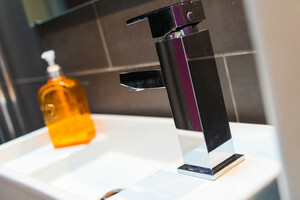 The heating works perfectly and is easy to control centrally such that hot water is readily available. The kitchenette has everything you would need, should you decide to cook for yourself. WiFi is excellent Location is really excellent with public transport readily available. Located a stones throw from both Arthurs seat and the Meadows. A 20-25 min walk should get you to the city centre, the castle and the royal mile. 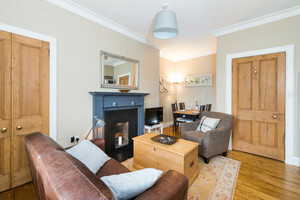 Plenty of local pubs & restaurants in the vicinty make this flat an ideal choice for anyone wishing to visit Edinburgh and I would have no hesitation in recommending the flat for your visit. 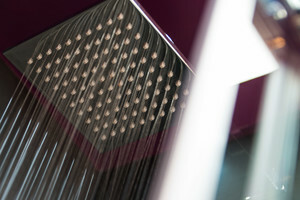 Lorna runs a very professional operation with easy & uncomplicated communication. Check-in was as smooth as can be. Fabulous flat in a quiet street but so close to the shops & restaurants around Newington. We couldn't have asked for more from Lorna pre-arrival and Magda was there as arranged to show us round on arrival. Being top floor the flat is very quiet ( and sunny!) with great views and sunsets. The beds and linen are superb so you're guaranteed a great night's sleep, after exploring this wonderful city. We'd love to return and stay in this very special flat again. 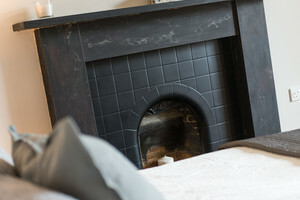 The wonderfully comfortable beds and attention to detail throughout meant we felt thoroughly relaxed and 'at home'. For us, visiting our daughter at Uni, this was in the ideal location and being so quiet meant we could relax and sleep well, increasing our enjoyment enormously! Pro: The location! The apartment is just a few minutes walk to the restaurants and supermarkets. It's clean and well-appointed. Contra: The stairway to the flat is something you have to get used to. There are no free parking spaces in front of the house. You better leave your car at home or you will spent lots of money on long-term parking areas. The apartment includes everything you need for the everyday living. Supermarkets and restaurants are just a few minutes walk from the flat. The stairway is something you have to get used to, but the apartment is nice and clean. There are no parking spaces you can use and it's really expensive to park your car in a long term parking area, so you better leave your car at home. The Royal Mile, Edinburgh Castle and Arthur's Seat is near by and it's worth while! The apartment is recommendable. We stayed in the well appointed apartment beautiful days. On foot everything is to the town center within easy reach, or take the bus. Communication with Lorna was exemplary, as is the timely receipt of the apartment and the pleasant on-site training. When arrived with heavy luggage you have to know that the apartment is on the 3rd floor. Lovely room - as beautiful as the pictures make it look. We have a great weekend, and the whole process was very easy. Thanks! We stayed one week with Lorna and everything was very nice and we had great time. The flat was very clean and there's everything you might need. There are lot of restaurants and cafes around. If you travel with big or heavy bags, you should know that this is 3rd floor flat and there is no lift in the building. 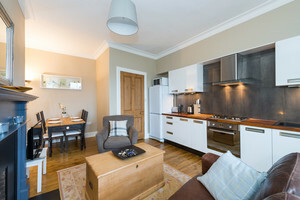 Wonderful apartment very convenient for exploring edinburgh and great facilities. No problems at all we really enjoyed our stay!! Wonderfull place, Great location. 100% recommendation worthy. Stayed for the weekend (3 nights). Great apartment. Very comfortable beds. 5 min taxi ride from the centre. We had a great time in the city and loved the apartment. Lorna was very welcoming and set us up with everything we needed. I would highly recommend staying here.